Despite a few attempts I could not get this to stick on the dashboard. It did go on the windscreen but subsequently fell off - rather disappointing. How well does it adhere to the screen. I bought this holder on the strength of the positive reviews on Mobile Fun. The two sprung arms hold the phone in place very securely and I have no worries about it slipping out. The holder can also be adusted for tilt and swivel. The sticky pad adheres to the dashboard with a good bond. Very swift delivery from Mobile Fun. One of the best phone holders I`ve tried. Holds the phone securely, easy to take the phone out and sticks to the dashboard really well. Sticky pad on base keeps it in place, works in my car on textured plastic finish, I would definitely recommend. This seems to grip to anything - the mottled surface on my dash or the really knobbly coin tray (where I had no intention of putting it but wanted to test)... The phone clamp is perfect for my Sony handset: Keeps it steady whether its clamped in the middle or at the ends. This was one of the best phone holders i have ever brought, it’s so secure, has a good grip for my phone (iPhone7). Just as described. Easy set up, sticks well to the surface of the dashboard and holds phone firmly in place. Very pleased. Strong, good size, nice product. Feels like a solid product, all moving items good quality and holds the phone tight. Sticking plate very strong too. Better than others I’ve had. Wanted for dashboard mounting (Audi Q3) it does not stick. Tried a dozen times before throwing it in the bin. Once clamped in properly, works like a dream. Got the iPhone 6 Plus and it's a tight squeeze but it does still fit! This is a good item, that looks the part and sticks well to the textured surface of my cars dashboard. Can insert and remove phone with one hand, but two is better. The holder is detachable from the base and this fits my Garmin Sat Nav bean bag mount thereby giving another option if needed. I bought this for my husband and once he got used to it he was delighted. It grips his iPhone 6 very securely and sticks to the dashboard very firmly. You know when you go over a bump in the road and your phone holder and phone fall off into the foot-well? Doesn't happen with one of these. I sticks like a limpet even on a textured plastic surface that is slightly curved. Sticks well to a smooth area on the dashboard and grips the mobile very firmly. What's not to like, i bought this phone holder because I couldn't find a custom holder for my"Oneplus" phone. It holds well on the windscreen and would suit any phone on the market.Also it will rotate to any position. 10/10. I have yet to install the Olixar Grip Mount Pro Case Compatible Car Holder. However, I see that it is well designed and holds my mobile phone safely. I am confident that it is fit for that purpose, but I doubt that it will hold the car (lol). This device does exactly as advertised with excellent phone holding capacity and great adhesion. Your phone is easy to insert and remove and is very stable during a journey. A very good product. This is a quality product holds my IPhone in place over the bumpiest roads, well worth the money, would recommend this one if your looking for a car phone holder. Holds the phone firmly without vibration. Spring tension in the clamping part is quite strong. Good and easy adjustment to get just the right viewing angle. Recommended. I bought this device for my van as I was going to London in an area I wasn't sure how to get to and it stuck well and held my phone so I could follow gps . I've looked around for something that looks good, does the job and won't fall apart after a couple of weeks. I've found it. After hearing bad reviews about various windscreen holders I was looking for one that can be placed on the dashboard. This one is ideal plus it doesn't look cheap and is easy to set up. This is the first phone car mount I have ever purchased. I've only used it a couple of times so can't really comment on how well it will last. So far I would say it seems to be well made and sticks to the windscreen very securely. I haven't tried it on the dash. This is being used on a dimpled Caddy dash and sticks easily and well. Feels solid and the lever action for the suction is handled with one hand. Excellent value. I've had numerous in car holders in the past but this is by far the best & easiest to use with the least amount of interference to the vehicle interior surfaces. I would highly recommend this holder to anyone looking for a secure Smartphone mount. Bought this item to stick on my dashboard but it wont stick there so have ot use in on my windos instead other than that it does what it is supposed to do. Purchased this holder from Mobilefuns large range of phone holders as it had very good reviews, only had it for a few days, but so far it does what it says on the tin. Arrived 3 days after I ordered it, seems to be well made. The website was very easy to use, excellent service from Mobilefun. Although I have only just received this holder for my phone I am pleased with it. It was as described and holds the phone well and it is possible to engage and remove the phone one handed as described. No problems yet with it falling out, but this will depend on how long the springs last. The suction pad does stick well to a flat section of my dashboard even though it has a non-smooth surface - again how long it will remain stuck remains to be seen, but good for now. I would have liked to know if it is okay to attach to heated front windscreens (which I have). The suction cup has an incredibly sticky rubber like material which out performs anything I've used before. It grips the phone well. Does what I expected it to, and does it very well. I did a lot of researches befor ordering this item and i am so so happy now. I was looking for great quality, small, handy and good looking phone holder. This one made me 100% satisfied. I can honestly recommend - when i take this holder into hands its straight away noticable that its the item that is going to last as the quality is very good, its far away from cheap cheenese fake plastic. Its very stable!! And keeps my phone during driving very solidly. Now using phone in the car is the pleasure- not a problem. And it doesnt take a lot of space as many of the car holders. Whats more- you can easily wash it under the water and also there is a cover for a sticky part while caring on with you. The gadget I purchased previously was rather cumbersome and was stuck safely on thee screen. Unfortunately it fell apart. I needed something not so complicated and less moving parts. I searched the internet and this item seemed to be the most useful. It arrived very quickly. I fixed it on top of my dash. It is solid in its place and holds my phone tightly. There is no shaking when I am driving and my phone has never dropped out. My phone has a curved back. Still it sits tightly within the sprung grips. Yes I'd recommend it to others and yes I'd purchase it again. It is an excellent product and strongly made. Excellent product that does exactly what it is supposed to. Te Included disc to stick a ough surface is real bonus. This has to be my third one, highly recommend. The holder apparently combines a sticky base and vacuum to hold well even on patterned plastic dashboard surface and would no doubt stick well to glass. My only gripe is that it was advertised as workable with one hand, but it is almost impossible to put your phone in with one hand as the springs are too strong, I tried levering it in obliquely but it just chipped my protective glass on the very edge. When I get into the car and seat belt up, start driving, fish the phone out of my trouser pocket and by that time I'm moving I just want something to work single handed. The springed edges also invariably start the camera on my Xperia so I then have to fight to reposition and switch off, not good whilst driving. Does what it says. Can be moved to different positions on the dashboard without leaving any marks. It is small enough to be placed in position without obstructing the line of sight through the windscreen. Amazing squidgy suction material gives superb grip on any flat part of dashboard enabling the USB or charger cable to be fitted if required, in order to use a smartphone as satnav. Bought the GripMount Pro Case Compatible Universal Car Holder after wanting to have something that was stable enough to hold my phone as I use it for navigation. Bought this product after reading reviews and I am not disappointed. Great stable device which can hold many models and it has strong springs that hold any size phone. Definitely would recommend to others. over the years I have had a number of mobile phone holders. All have eventually malfunctioned. This holder is robust in construction and stays put on the dashboard. It has once come loose but is easily re-stuck to the dashboard. Does not seem to mark the dashboard. It is very easy to fix your phone to the device and release. Great product and works very well even in a hot car. Was not sure about this product. After reading reviews I decided to buy. Glad I did! Superb bit of kit. Using in Berlingo van. No probs. Does as it says. is strong. Am happy with the product, no complaints. Just what I was looking for, and believe me I looked!! Brilliant Product. As described. This phone holder is ideal, attached & holds really well on all surfaces on my dashboard. Couldn't be happier. The best one I have bought by far!! Returning the holder: it constantly slips off the dash even with the extra-supplied sticky patch. I love the GripMount Pro Case Car holder that I purchased..It was compact and very easy to use. I would recommend it for people to buy. Exactly as described. Stuck directly to the car dashboard for a solid, functional holder. This holder sticks to my dashboard as if stuck on glass. It is on a fairly uneven surface but have had no problems with it coming loose. Very easy to insert the phone. Good grip so be sure to stick it where you want it! I bought this item as I thought it would be easy to remove when not in use. It has very powerful suction, so much so that when I tested it on my kitchen counter it took some major manouvering to remove. I now know that it will be secure in the car! It grips my phone well too. Perfect piece. Really nice and small compact size and solid does what it says. very useful. I prefer this cause you stick this any where you like on desk or on windscreen not like other once you have fix it on Air con. very happy with product and happy to have this one. Bought this product as it had good reviews and am very pleased with it. Very sturdy and uncomplicated. This is a fairly unobtrusive device which holds my iPhone 6 plus securely, with endless location options. It adheres to any surface, including textured dashboards and surfaces that are "not quite flat" Its 360 deg rotation and tilt adjustments make it easy to adjust the viewing angle. I am also able to position my phone to use my "car cam" app. I would highly recommend this as a quality holder for your device. My first car holder broke the spring went but it was changed with no hassle. For the price, this is an excellent device, it can stick to the dash board and the screen very easily. It doesn't stick to the breathable dashboard, but it has a pad to stick on as a base, I personally wouldn't prefer to have a pad permanently on the dashboard so I just use the screen. Easy to install and use, you can get set up in seconds. This really sticks well to the dash, is easy to mount and looks cool! It holds the phone perfectly and is easy to get on and off,would recommend if you need a strong sturdy holder that looks good. I really like the dock for my car to hold my phone. I travel a lot so this a very good, useful item. I have had a number of mobile phone car holders over the years This is by far the best I have had Normally I have one's that fix to the screen which this does very well.I decided to fix it to the dashboard which it did very securely. I needed to reposition .This was achieved easily without leaving a a mark and sticking firmly again. Love this product. Awesome grip. Very steady and strong built. Great buy. Most compact,yet simplest & strongest mobile car holder I could find! Ordered one of these mounts, and found it to be so good that I immediately ordered a second one for my other car. It fits easily, and the suction mount holds really well to the textured surface of the dashboard without any fuss. After giving up hope of finding a reliable phone holder, that actually held the phone! Came across the AMAZING GRIPMOUNT amazing is an understatement,this is the first phone holder that I have had that actually does HOLD the phone,added bonus easy peasy to use. Arrived swiftly and I put it on my dashboard straight away. Very easy to install and it has nit moved at all! Used it to hold my iphone 5 when I needed the sat nav and it worked a treat. Did not shake or shudder like others I have used in the past. Would definitely recommend to my friends! I'm delighted with my purchase. I fixed it on my dash and it just refuses to budge from there. Not that I wanted to re-position it, but just to check its firmness. The silicone base is really, really good and though my dash is dimpled, it's rock firm. I didn't even have to use the 3M sticker base that ships with the product. Because of it's compact and short height, the stand doesn't shake or vibrate and so neither does the mobile. The mobile grip has a tight tension spring so it really grips the phone really well. Even on bumpy Delhi roads, I can be sure that my phone is in safe hands. Awesome product. Will give it six stars! A stylish streamlined design. My Samsung phone fitted perfectly. I stuck it direct to the dashboard without the need for the fixing disc which is supplied.It has remained securely fixed. Just what I was looking for. Delivery was on time, fitted in moments well worth the money, thank you. Does the job well. Can hold phone portrait or landscape. Has stayed in place over bumpy roads. Reccomended. At last! A phone holder that sticks to the dashboard and stays there! At last! A phone holder that sticks to the dashboard and stays there! 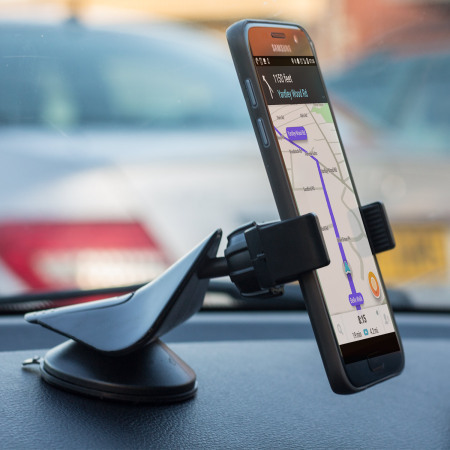 With many cars having the windscreen a short walk away from the seat this mobile holder is the ideal solution to being able to use the screen for sat-nav, selecting calls etc without needing Mr Tickle's arms. I had a long journey with the kids this Easter break and thought I'd take a chance on this so I could use my new phone for tunes and sat nav….. It’s a fantastic bit of kit I'm pleased to say. The suction cup was really sticky and as usual tried it all around the house to start with… table, fridge, door etc. Worked a treat. In the car though I used the supplied disc for a base as the dash in my Citroen looks like it was designed by Salvador Dali! It's a heavy phone but the base stuck solid and handled all the off road bumps of the day without budging one bit. The adjustable fixing also allowed me to twist the screen back and forth throughout the day to avoid sun etc. On the way back we used my daughter’s Samsung which is much smaller than mine, but being a universal grip it handled it with the same stable competence as before. It's not often I buy little bits and pieces like this but I'm pleased to say I'm happy I bought this one. Very prompt service! Excellent holder and stays in place on glass, plastic and vinyl. Easy to manoeuvre smartphone into any position. This is a replacement - my son permanently borrowed my first one! This product does what it claims, I had a "life proof" holder that claimed to stick too (it didn't). This is definitely worth the price.